Sergey Pulinets (co-coordinator), Dimitar Ouzounov (co-coordinator), Katsumi Hattori, Tiger Liu, Alexander Namgaladze, Michel Parrot, Dmitry Solometsev, Valerio Tramutoli. Specific cases for complex multiparameter data analysis were selected and persons responsible for the data collection, processing and coordination of the scientific outcome from every case were determined. Directions of the theoretical development of the Lithosphere-Atmosphere-Ionosphere-Magnetosphere Coupling Model were determined and the key points of the model improvement were precised. Preliminary list of the future publications was determined. During the course of the meeting every participant made presentation describing his scientific activity and the role in the project. 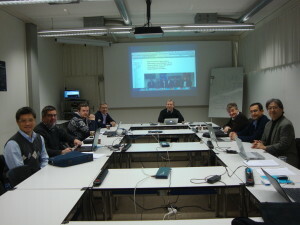 It was agreed to make the special meeting of the group during the EGU 2014 Assembly in Vienna.